We have a vast range of plants and pottery in all shapes, sizes, colours. Wrights Watergardens is the perfect place for weddings, birthdays, and special occasions. Our centerpiece is the iconic Mauku Waterfall and stream. The area has a rich and eventful history. 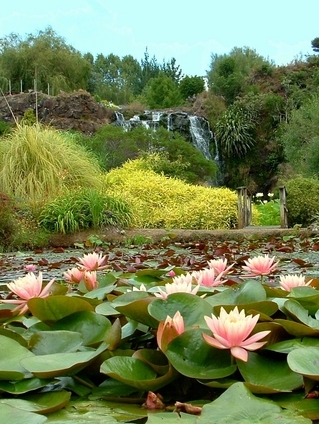 A stunning and picturesque watergarden located 45 minutes south of Auckland city. 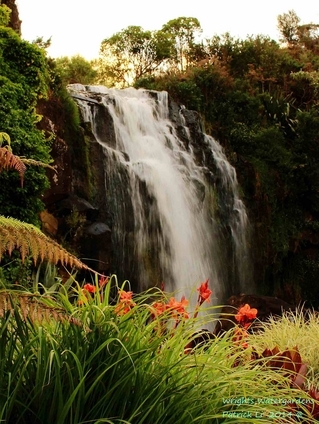 Ponds, colourful gardens and winding pathways surround the iconic Mauku Waterfall. 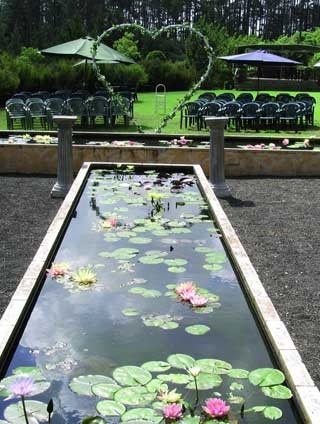 The garden is a great location for day visits, retreats, weddings and special occasions. Relax in the bright red pagoda of the Oriental Garden, venture your way through native bush along the Mauku stream, sip a cappucino at our newly-reopened café. Our café is now open with a delicious and fresh menu. We sell waterlilies and lotus plants, along with pond fertilizers and other accessories. Our gift shop is full of locally-made goods and a range of stunning pottery and art. The gardens are a great place for a family day out. Kids especially love our turtles, tadpoles and the eel pond! We have peacocks, turkeys, chickens, alpacas, and even toy poodles roaming around the gardens. All of them are friendly and loved by kids and adults alike. Please note: due to height and water hazards, children must be supervised by an adult at all times. We warmly invite you to bring your dog out to enjoy the gardens with you. We ask that you bring a leash and clean up after any mess that they might make. The garden opens October-May Thursday to Sunday 10am to 4:30pm(Last entry).Open on public holidays. The Watergarden function room is available year-round for weddings and special occasions. Please contact us for more infomation.